What are the building blocks of a scene? The scene’s terrain or “land” is typically made up of Tiles. Much like the tiles on your kitchen counter or bathroom, Tiles in a game are uniformly sized pieces of land that conform to a grid. This article will cover the basics of importing and working with tiles. You'll now see this window. Pick out the Tile Width/Height. This will determine how your tile sheet is cut up. In most cases, this is 32x32 or 16x16. The spacing and border fields are for cases where your tiles are spaced apart. This is rare. That's it. Click Add to finish the import. 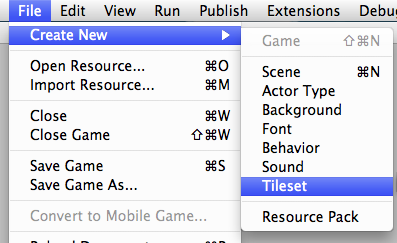 Now, you'll see the main page for your newly imported Tileset. 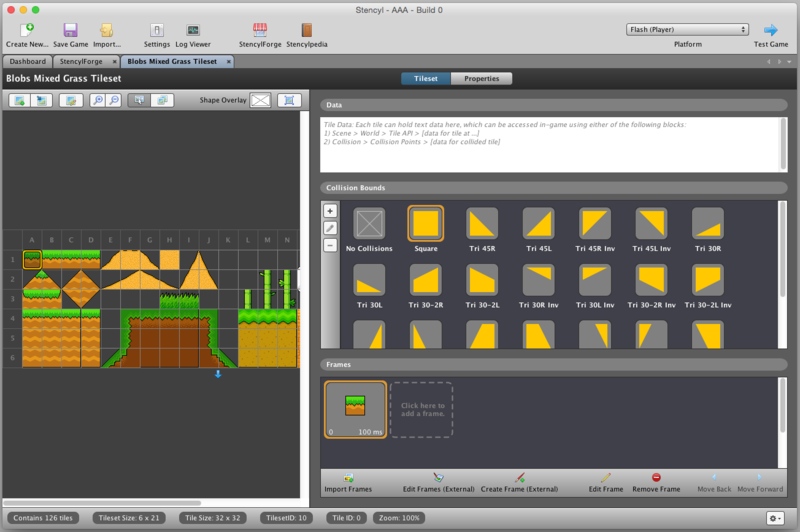 The Tileset Editor is split into two parts. 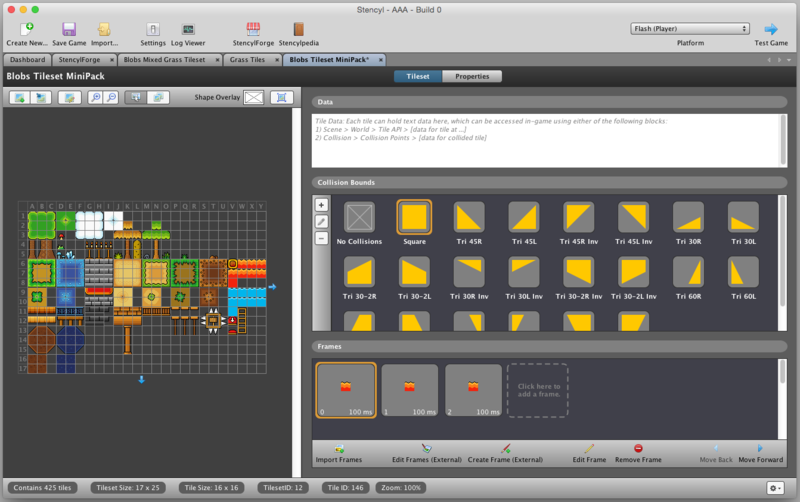 On the left is the tileset itself and controls for rearranging it. Clicking on a tile will display information about the tile on the right. You can choose the tile's collision shape and animate it, if you wish. Create a custom collision shape. Picking a shape is simple - just click on any entry within the Collision Bounds pane. 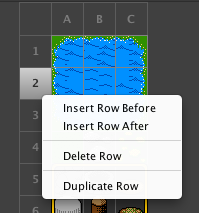 This even works when multiple tiles are selected (click and drag to select multiple tiles in the left pane). If you prefer to make a custom shape, click the + button. 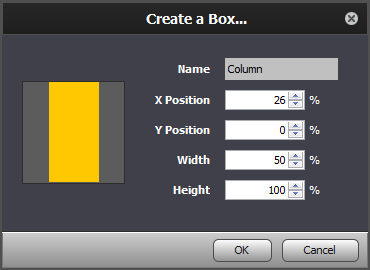 You'll get a choice between creating a box (rectangle) or a convex polygon. To learn more about tile collision shapes and how to define custom shapes, view our Setting Tile Collision Shapes article. Some games use Animated Tiles to bring a scene to life. Here's how you convert a plain tile to an animated one. Click on the Tile you'd like to animate in the left pane. You'll now see information in the right-hand pane. The bottom part of this pane should look familiar. It's the same as the one you use for managing an Actor's animations. Import frames from an image strip/sheet. Edit the frame durations, if necessary. 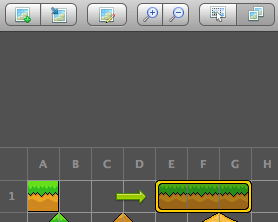 You can alter a tileset's row and column count by clicking directly on the row and column headers. You may add additional tiles to a tileset after the initial import. For best results, we recommend importing using an image that is the same width as the existing tileset, so additions don't get "offset" and break the layout. For example, if your tileset is 6 columns wide, ensure that what you are importing is also 6 columns wide. You can drag and drop tiles to rearrange them. Here's how. 1) With the Select Tiles mode active, select the tile(s) you wish to move. In this example, we've selected some tiles in row 1. 2) Now, switch to the Move Tiles mode. 3) Drag and drop your selection to the desired location. This will perform a swap between the tiles you have selected and the tiles in the desired location. In this example, we've moved the tiles 3 positions over from their original position. You can select multiple tiles at a time by clicking and dragging a box over those tiles. What's the use of this? You can edit multiple collision bounds at the same time, a major time saver. As described above, you can also move/rearrange multiple tiles at a time. 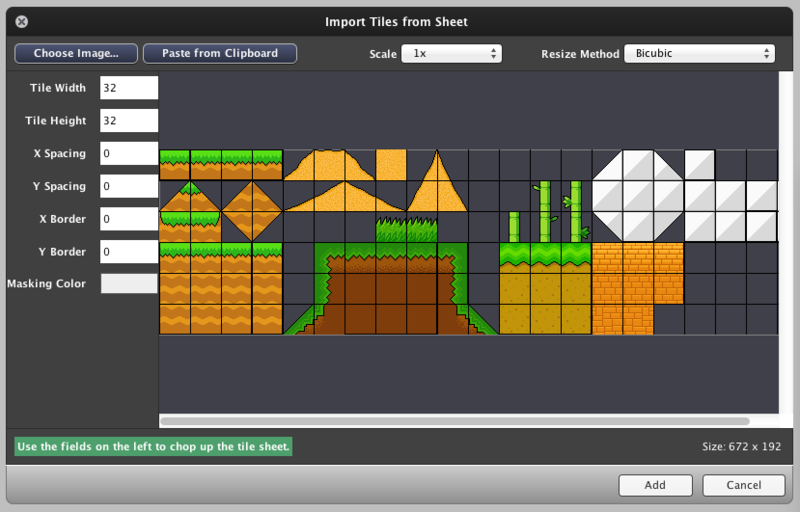 Edit the tileset's backing image directly in an external editor. Reimport the image, provided that it's the same size as the existing one. Replace the images for selected tiles. This allows you to make visual tweaks to the tileset without having to reimport everything or manually edit the image from the game's directory. You can tag tiles with textual data that can be accessed during game. For example, a lava tile could convey that it's deadly to the touch, or a healing tile in an RPG could heal the character passing over it. To access this data from a behavior, you can use one of two methods. Use the data for tile block under Scene > World > Tile API. Use the data for collided tile block under Collision > Collision Points. If you've worked with mobile games, you'll know by now that all graphics should be imported at quadruple the standard resolution, in order to support larger resolution displays and tablets. Tilesets follow this same rule. Import Tilesets at 4x the native resolution. However, when you actually import, you still specify the Tile Width, Tile Height and other parameters in 1x. It's just the IMAGE ITSELF that you import at 4x. Example: For example, if your game's regular tile size is 32 x 32, you should import a tile sheet where the tiles are 128 x 128 and specify that you are importing at 4x. The Tile Size is kept at 32 x 32. Keep the tile size for all tilesets and scenes the same. 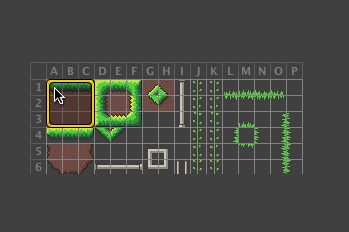 For example, if your tilesets have a tile size of 32 x 32, make sure that the scenes also have a tile size of 32 x 32. 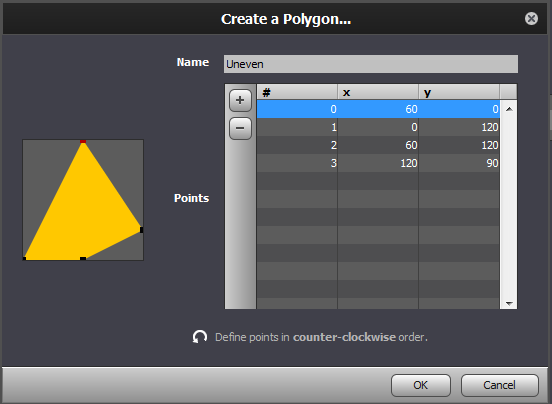 When defining custom polygon shapes for Tiles, you can only use convex polygons. If you need to make a concave polygon, use multiple tiles to achieve this. In very rare situations, a scene may crash in game if the terrain is complex enough to exceed our engine's internal limit - there's no exact number, but it's on the order of hundreds, possibly thousands of sides. This happens because we combine all of the shapes into larger ones to improve performance. This can be worked around by altering the terrain to break up the large, offending shape into 2 smaller land masses. What if you want to change a scene's terrain at runtime? For example, you're making a game with automatically-generated dungeons. Use the Tile API, a special set of blocks, to accomplish this. Tiles are uniform building blocks for scenes. You can specify custom collision shapes for tiles and animate them. Tiles get auto-combined by Stencyl into large land masses in order to improve performance. When making my own tile sets should i save as JPEG or GIF? 1. In your dashboard, right click the tileset you want. 3. In the newly oppened tab, left click the tile you want to make transparent. 4. You will see it opens a box titled "Collision Bounds". 5. Select the "No Collision" option, which is usually in the top-left corner. 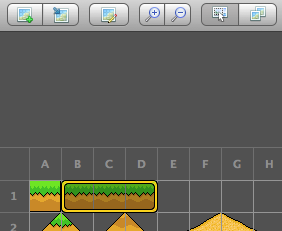 How do I layer tilesets so that I can put a tile on another tile without deleting the first one? Is there a way to make tiles walk through-able? Would help to know how! how can i change tile size? or i have to use only 16*16 and 32*32? These are the steps I used for successfully importing the "Miscellaneous Landscapes" Tileset from StencylForge to my Dashboard > Resources > Tilesets so they could be used within my scenes using the Scene Designer. Go to "StencylForge" -> Within StencylForge tab navigate to folders -> Media > Tilesets -> Type "Miscellaneous Landscapes" in Search Bar -> Select "Miscellaneous Landscapes" -> Click on "Download" to download Tileset -> Select First Tile in position "A1" in the Tileset -> Set Collision Bounds to "Square" -> "Save Game" -> Go to Dashboard tab and navigate to folders -> Resources > Tilesets to see "Miscellaneous Landscapes" Tileset. Navigate to Dashboard tab -> Resources > Scenes folder -> Click on "Edit" to edit selected Scene -> Select "Pencil" mode within Scene Designer -> Click on Palette > Tiles select and drag into the scene any of the 160 tiles within the "Miscellaneous Landscapes" Tileset to use in your scene. When I load a tileset it ends up shrinking it after selecting the image. It looks fine after it displays the image I loaded and then when it goes to the tileset editor, after loading, it's offset and shrunk! 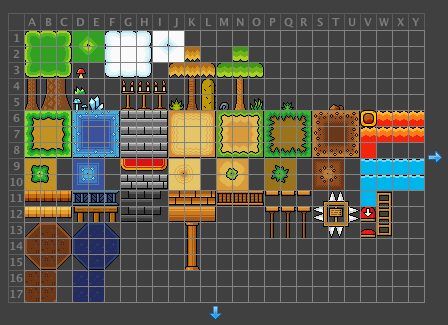 It even does it with the standard tileset image in the crash course kit. Can tiles with no hitboxes cause the framerate to drop? For instance, if I were to use them to make a chain-link fence or a shadow in front of a section of a scene?